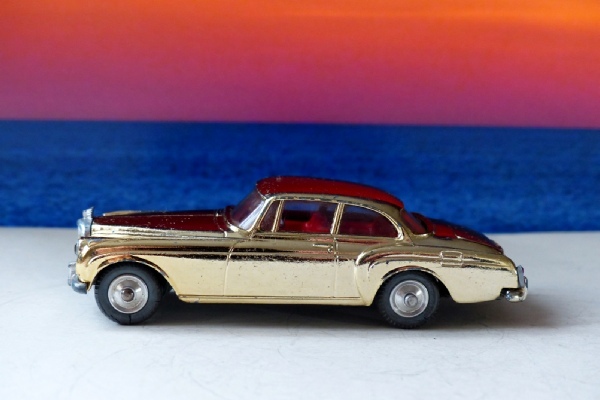 From the Golden Guinea Gift Set 20, available for a brief period between 1961 and 1963, this is the Lovely Bentley Continental with gold plate effect paintwork. This finish tended to get pitted over time and the paint was also vulnerable to flaking but this has survived well and looks brilliant. It has all the original jewels, including the rear ones and both fog lamps and the radiator icon is there too. There is even a spare in the boot. Until I can track down a Gift Set 20 box this and the other two in the set are available individually if anyone needs one to complete their set. This is by far the most difficult to find in good condition. Only 23000 sets believed to have been sold, making this one of the scarcest production Corgis.